The National Hockey League Players’ Association has revealed its 2017-18 NHLPA Player Poll results today. Over 500 NHL players surveyed from all 31 teams on variety of hockey questions. TORONTO (March 7, 2018) – The National Hockey League Players’ Association (NHLPA) has revealed its 2017-18 NHLPA Player Poll results today. Visit www.NHLPA.com/player-poll/2017-18www.NHLPA.com/player-poll/2017-18 to view the full results. NHL players were surveyed regarding their opinions on more than 20 hockey-related questions during their annual NHLPA team meetings between the preseason and early January 2018. Over 500 players took part in the player poll. NHL players weighed in on a variety of questions – covering skills, coaches, officials, arenas, teams and on-ice matters. • Player who is the most difficult to play against – Sidney Crosby received 29.9 percent of the 435 votes from the players who voted on this question, with Connor McDavid finishing second (23.7 percent). • Most underrated player – Nicklas Backstrom was voted for by 8.6 percent of the 385 players who voted on this question, followed by Jaden Schwartz (6.8 percent), Nikita Kucherov (6.2 percent) and Aleksander Barkov (6 percent). • Goalie who is the most difficult to score on – Carey Price received 41 percent of the 439 votes from the players who voted on this question, followed by Jonathan Quick (12 percent), Pekka Rinne (9.3 percent) and Sergei Bobrovsky (8.2 percent). The players were polled on many other questions, such as which player they would want on their team to win one game; which coach they would most like to play for; and which team has the best fans. In a nod to the NHLPA’s 50th anniversary, the players were also asked five questions about some of the game’s all-time greats, such as who would be the one current or former player they would like to have as a teammate and who was their favourite player growing up. “The players hold a truly unique perspective inside the game, and we think the results of our player poll should give fans and media a glimpse behind the curtain,” said Mathieu Schneider, NHLPA Special Assistant to the Executive Director. 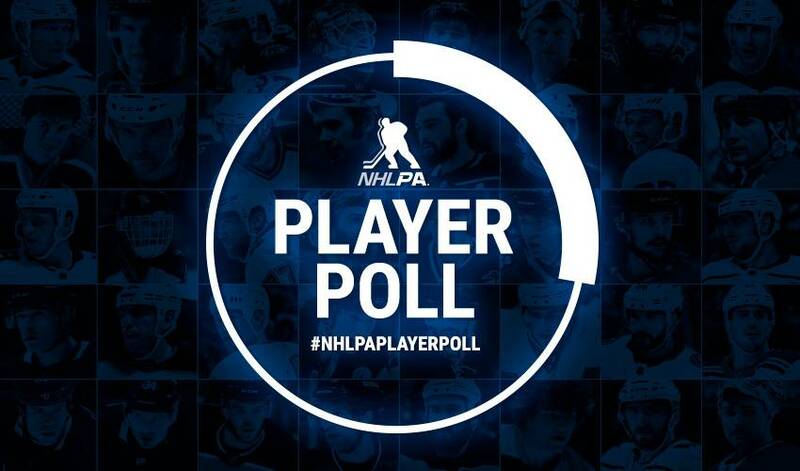 Join the conversation with #NHLPAPlayerPoll, and be sure to follow along on Twitter, Facebook and Instagram.